I was on the phone with my daughter while still at the office and I happened to notice an image on my office window. It really was quite large, probably 2 inches long. I remember these from my youth. Oh lordy are they one of the insects I dislike. While riding home on the school bus from picture day in early September of the 4th grade, one of the boys grabbed one, crunched it just enough to disable it and dropped it down the back of my dress expecting me to scream like a...well...girl. (I dislike that phrase immensely. Some of the biggest scaredy cats I've ever met have been men. Why isn't it, "Scream like a guy" as if women have a lock on screaming?) When we got home, mom insisted on photos on the front porch. Somewhere, I have that photo. I sit, all prim and proper, in my light green seersucker dress all the while this grasshopper in the throes of death is squirming on my back. I remember bursting into tears when she was done and peeling off the top, ripping the armholes in the process. Mom was friends with the guy's mother so she took the offending grasshopper to Katie and demanded an apology. I think I got one, half-hearted. He was a small in stature guy and I'm sure he was bullied about his height or lack thereof. His way of dealing with it was to move the bullying down the line. He was already disappointed that I didn't scream or squeal when he dropped it down my back. Being forced to stand in front of all of us, his and my parents, and apologize was a huge humiliation. But, he never picked on any of us again. I never, ever liked him, but I really liked his parents. Locusts are bigger than this. My dad would tell stories about watching them come in clouds at the end of summer. It seems to me that these 'clouds' weren't like the ones the Plains states had during the Dust Bowl years. But I'm fairly certain there would have been clouds, more like a bulbous group, coming and settling into the fields and eating anything they could. I also remember dad saying grasshoppers were great fishing lures. I don't remember what liked them, but I do remember him spearing the hook and tossing the still wiggling insect into the Mississippi. I was scared of them for many years after the bus incident. They are wholly unpredictable. One insect might engage you in a staring contest. Another might hop straight up as you approach and then there are the ones hidden that fly off as you walk by. 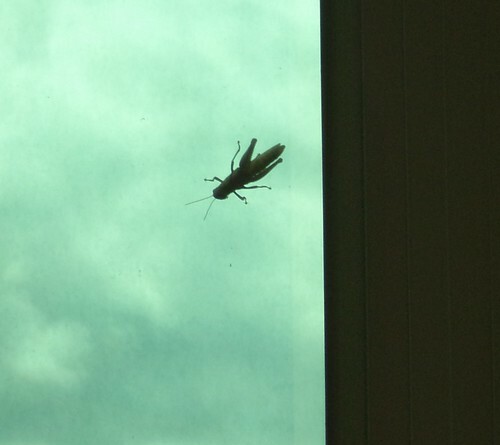 How many times have I been startled by a hopper that happens to share his air space with my body? That's when I scream simply because it's large and it startled me. It took awhile, but they don't scare me anymore. They are quite fascinating when you get down at their level and look at them. Compound eyes and leg muscles which, if translated to humans would allow us to jump almost to the moon. Still, they should keep their distance from me. I can yelp, only don't tell me I sound like a girl.